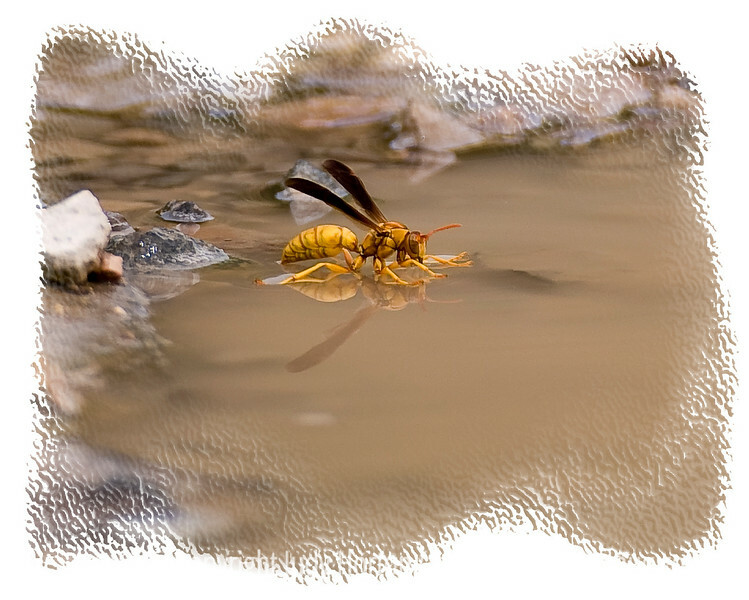 This wasp was sort of floating/walking on this puddle in Big Bend National Park in Texas. Note his reflection in the water. Look at it in the largest size to see the detail. I love insects and am always trying to take macro shots of them, though I don't seem to succeed too often. This one is better than many I have taken. I really appreciate all the comments on my pelican image. We are having storms move through tonight...rain, sleet, hail and snow. Beginning early in the morning, we're supposed to get a lot of snow. We'll see. They miss the forecast about as often as they get it right. Hope most of you are having better weather than we are. From the pictures, I can tell that a lot of you are in the midst of spring. Enjoy your spring! Great detail and reflection, but not crazy about the frame!